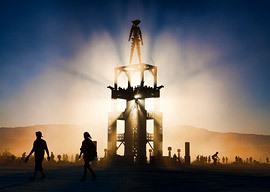 Our own Michelle Itagaki, an experienced “Burner”, describes her several trips to this gigantic art festival, a celebration of creativity, personal freedom and self- expression. Prez Jim Young welcomed the assembly to the “last floating lunch meeting of the Relatively Rambunctious, Reasonably Ribald, Remarkably Resilient, Richmond Rotary Club.” Dan Tanita led the club in the Pledge of Allegiance. Prez Jim acknowledged our guests today. They include Interact Club members who are students at Salesian High School, and their parents. Today’s meeting will be a little more emotional than usual so consider restraint in our otherwise emblematic enthusiasm. Prez Jim led the Invocation as a tribute to Don Hardison. “It saddens me to report to you that our senior member and an Outstanding Rotary, Don Hardison passed away peacefully in his sleep Monday night with his family at his side. Don joined Richmond Rotary December 31, 1945 and was club President 1986-87. Don was a founder of the architectural firm HKT Architects (which is still in business), a Fellow of the American Institute of Architects, and the designer of many buildings in West County and the East Bay. Don was nationally recognized for his work designing the ‘old’ Easter Hill which was ground breaking, racially integrated, multifamily housing that was ahead of its time but, unfortunately, was demolished to make way for the current project. Friday, Oct. 12th, 2 PM. In consideration of the Celebration of Don’s life, the October 12th Club Assembly meeting will start at 11:30 AM and end at 1 PM. This will enable Rotarians to attend both the Club Assembly and the Celebration of Don’s Life. Connie Tritt introduced her guest, Rich Ambrose, the Executive Director of the Richmond Art Center. Prez Jim Introduced Pate Thompson from the Berkeley Club who was visiting today in his capacity as BARSHEEP Membership Coordinator. Prez Jim reported that the word was out that Glenn Daggs is in the final stages of recertification as a Peace Officer and is about to start a new job as an investigator for the District Attorney’s Office. “On September 28th at 9am the School District is doing a ribbon cutting for the newly remodeled, state of the art dental clinic at Peres Elementary School. Twelve years ago I started the clinic and have kept it going with volunteers. We do free services for the kids. I actually started it as a Rotary project. Prez Jim observed that the Peres Dental Clinic and his 12 year effort are the kind of thing that exemplifies ‘Service Above Self’ in Rotary. He encouraged all members who can to attend the Friday ribbon cutting at Peres. The Prez was glad to see the membership at La Strada. You would think we are the Gypsy Rotary Club instead of the Richmond Rotary Club. Next week, post golf tournaments, we are at the Richmond Country Club. The District Governor will be the program Oct. 5th. Be here for a big dose of Rotary, a refresher course on how to tie a toga and a special surprise demonstration of dealing with toga emergencies. Remember, ‘Yah gotta be here for the good stuff’. And that includes being at the District Conference in Napa. The Board met yesterday and did some real work in preparation for the Club Assembly October 12th. This included consideration of membership, efficient operations, decision-making, and the Rehfuss funds issue. We will describe all this in detail at the Club Assembly, October. 12th. To ensure we have the greatest attendance possible, Herb will deploy ‘Herb’s Harassers’, calling members to remind them of the meeting. Please mark your calendars. EC Rotary wants you to know that their Wine Tasting Fund Raisers is Sunday Oct. 21st 2:30 – 5:30 at the MVCC. East Bay Rotaract is having a fund raiser lunch at Marica Restaurant, 5301 College Ave, Oakland, Sat. & Sun, Sept 29th & 30th. Their goal is to raise $1000 for the Project Blue Girls Academy in Debre Markos, Ethiopia. The Academy is a school for teenage girls who were orphaned as a result of HIV/AIDS. Flyers are on the tables. District Foundation Fund Raising event, ‘Rotary Day at the Races’ at Golden Gate Field, Nov. 17th @ $35/person with 10% of the gate going to the Rotary Foundation. If 12 members go a bunch of cool stuff happen, See Pam for details. • RI Director John Blount , Past District Governor, District 5130, Member of RI International teams including New Models, Rotary Action Groups & three PR President nominating committees. • Sunni McPeak, President and CEO, California Emerging Technology Fund; Former Secretary of the California Business, Transportation and Housing Agency. Past CC County Supervisor; and speaker at Richmond Rotary meetings..
• The legendary Cliff Dochterman, and many more notables. Did Jim mention the Hospitality Night & the Toga Party? Interact Coordinator Henry Moe introduced the new co-Presidents of the Salesian HS Interact Club who both attended Camp Royal last year. They produced a short Power Point program about the Camp Royal experience: confidence building exercises that make up the core of the camp experience. They thanked the club mightily for the opportunity and for the new confidence it helped them develop as Interact Leaders. David Keystone got into the Recognitions groove, beginning with Jim Young. Jim reported that he and Linda began celebrating his birthday early, on Wednesday night, with the 1% at the SF Symphony Opening Gala, featuring violinist Joshua Bell. The beautiful people grabbed Jim’s attention: “Guccied, Pradaed, lipoed and siliconed. SF at its imperial best—or most fashionable anyway—drinking champagne until the cold drove us indoors.” Then next day Jim and Linda visited the Cindy Sherman exhibit at SFMOMA, and finished with Pisco Punches and dinner at the Pied Piper Bar at the Palace Hotel. Due to a sink hole that suddenly appeared in the scribe calendar, the scheduled scriber (who shall go unnamed) was absent from this meeting. Crisis. Jim and Nick, and David Keystone stepped to fore to exercise their powers of recall. Not quite. David Brown had Happy Dollars for taking another huge step in his flight training. Dan Tanita gave $50 in honor of the free dental clinic at Peres School, referred to above. Sam: “A couple of nights ago she stayed out all night and the next day she told me she spent the night at her sister’s. It is possible that an innocent person is executed. It has happened numerous times. The death penalty can prolong suffering to the victim’s families because it entails years of appeals and other legal procedures. Nor can the appeal process be eliminated because it is critical to our system of justice. The death penalty is not a deterrent to people who would commit murder. Demographic data shows arbitrariness in the application of the death penalty, with a disproportionate number of minorities receiving that sentence. Religious values dictate that we regard all life as sacred. There are effective alternatives to the death penalty. Lt. Fajardo explained that, aside from the moral principles, one reason supporting the elimination of the death penalty is its high cost: $17 billion dollars for 17 executions in 7 years. 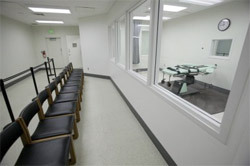 If Proposition 34 is passed, it will apply retroactively to persons already sentenced to death. It will require persons found guilty of murder to work while in prison, with their wages applied to any victim restitution fines against them. Lt. Fajardo presented maps of California showing the large numbers of unsolved murders and rapes in each county. If Proposition 34 passes, it will create a $100 million fund to be distributed to law enforcement agencies to help solve more homicides and rapes. Questions posed to Lt. Fajardo revealed, not surprisingly, that opinions on the death penalty were split. Some members are in favor of its elimination while others feel strongly that we should keep it. To his credit, Lt. Fajardo was respectful to all members of the audience, regardless of their viewpoints. Calfiornia now has 725 people on death row. The last time a prisoner was put to death in California was in 2006.